As concerned European citizens, we call on you to take all necessary steps to immediately carry out a trans-boundary environmental impact assessment under the EU’s EIA Directive and the UN’s Espoo Convention for all Belgian reactors. Until this crucial step is taken, the reactors in Doel and Tihange that are causing safety concerns due to the numerous leaks, cracks, and even sabotage attempts should be shut down. Public safety comes first. One of the aging reactors suffered a fire and explosion weeks ago and Belgium’s own nuclear safety chief called for checks after discovering 16,000 cracks! Neighbouring countries are raising the safety alarm and German Environment Minister, Barbara Hendricks, is ready to take our concerns into a meeting with Belgium on Monday. If enough of us back her in the next few hours, she can push Belgium to bring the plants to a halt until a thorough impact assessment is completed. Let’s stop this madness! A radioactive nightmare in such an overpopulated area affects us all across Europe. 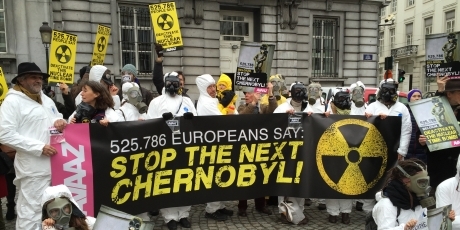 Let’s urgently deliver 750,000 signatures to Minister Hendricks and key neighbouring countries before her meeting, and make it clear that EU citizens will not allow Belgium to put us at risk of another Chernobyl. Sign and share on Facebook, Twitter, email… everywhere before it is too late.